Robert Levine's "Free Ride" is an important study, but a partisan one, as you can judge from its subtitle: "How Digital Parasites are Destroying the Culture Business, and How the Culture Business Can Fight Back." It explains that competing interests are at war, old business models for creator's and seller's rights have been disrupted, and new business models are needed. 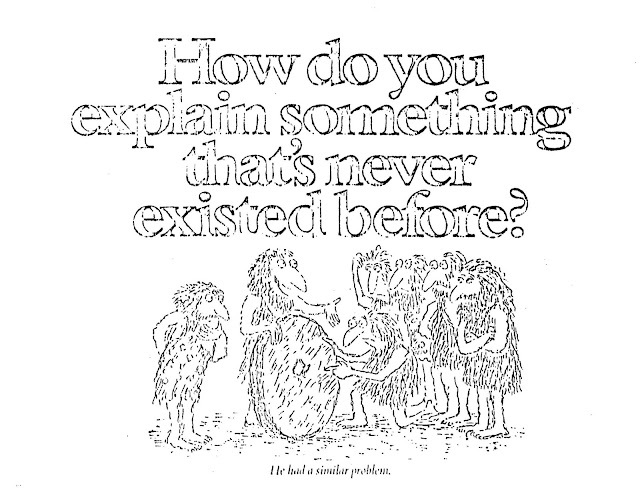 However, it is unable to offer much satisfying guidance to a solution. He offers only one potential solution: a compromise, and one that is old, awkward, and unappealing in many ways. What we really need is something new, a twenty-first century synthesis, one that offers a win-win solution, not just variations on the old zero-sum battles. 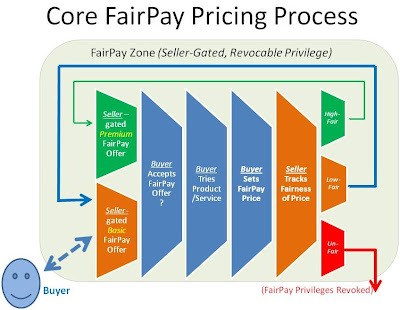 I suggest FairPay offers the kind of forward-looking synthesis we need, as I will explain in a moment. Yet Levine is hardly an apologist for the media industry. For example, he agrees that the term of copyright and statutory damages for infringement under U.S. law are way too long and large, and he finds the media industry just as guilty as anyone else of funding “research studies” that produce blatantly biased results. In fact, Levine’s journalistic instincts often get the better of him as he feels compelled to balance every factual assertion that bolsters his point with a counterfactual that softens it; the book ends up being far more balanced than its polemic subtitle suggests. My interest here is in looking forward to a better solution. As Levine explains in depth, we have been facing a problem that has had no well-balanced solution in sight. He presents a strong case for the rights of creators, and the practical necessity of incentivizing costly creations. He recognizes that piracy is hard to stop, and that part of the cure is to make it easy for consumers to buy what they want in the form they want, and he gives an excellent history of failed attempts to find better business models. "The real issue is how to establish a functioning market for content online." "A decade after Napster, labels of all sizes are still struggling to reinvent their businesses." Quoting Jeff Zucker, on "Business models to support the digital revolution...we are still very much in the beginning." It seems that no one has yet found the right synthesis. Levine does take a a bit of a stab at it, presenting a case for blanket licensing (or collective licensing), much like the model used for licensing music rights on radio via ASCAP and BMI, as the only viable way to address the current dilemma. I, too, have for many years seen it as the only systematic compromise in sight. 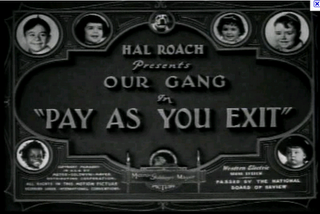 But there are serious problems with it, as nicely summarized by Rosenblatt: "...the many shortcomings of copyright and content licensing under such systems in Europe (and elsewhere): inequitable royalty distribution, irrational levy schemes, opaque accounting, inefficiencies, resistance to new business models, cross-border chaos, and more." In contrast, FairPay applies the power of the networked digital marketplace to bring twenty-first century solutions to the very problems it creates. 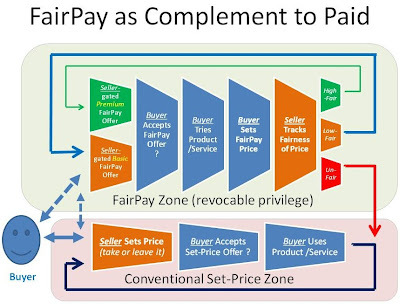 FairPay offers not a compromise within the old paradigm, but a radically new kind of synthesis -- one that changes the fundamental nature of sales transaction and the play of market forces -- to find a dynamic, adaptive, and nuanced solution to the problem of balancing creator and consumer rights. 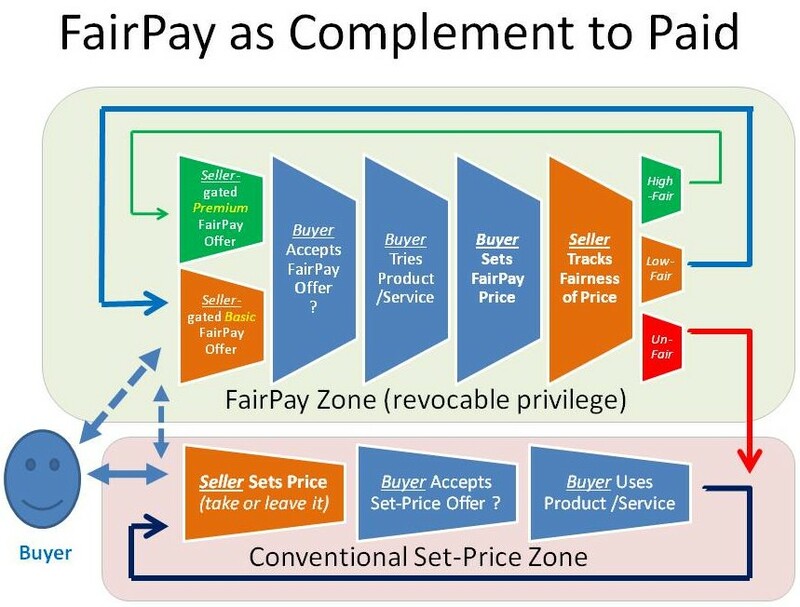 FairPay changes the rules to create more win-win marketplace, that expands the digital economy, and the opportunities for both creators and their consumers. 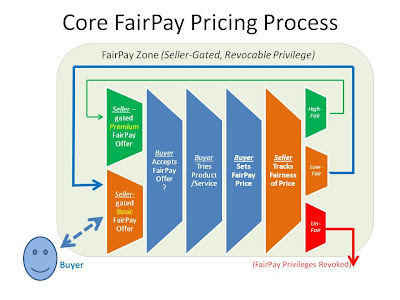 FairPay provides an institutional framework for deep two-way connections between consumers and creators/businesses--in the form of individual dialogs about the value of offerings, as actually realized by each user in their specific contexts. 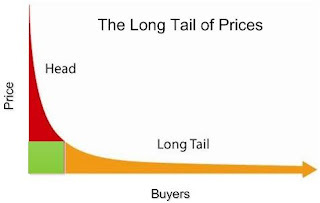 This can be done with a structured balance of powers in which the consumer sets an individualized price they think fair, and the creator/business continues to permit such transactions as long as they agree that consumer is "fair" about the price, using the power of networked markets to make that assessment. That can improve margins and market efficiency for creators/sellers, and can empower relationships based on fair value exchange (a buyer-agreed-to form of price discrimination). 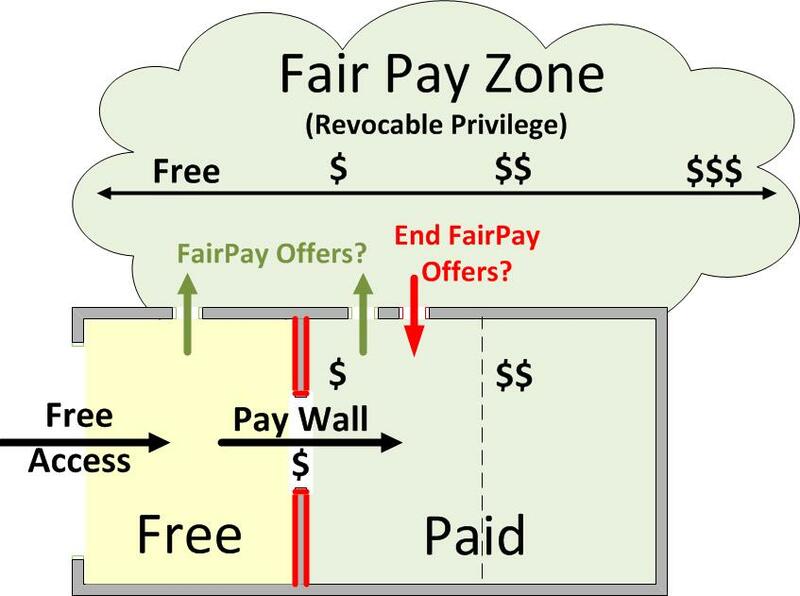 Think of a privilege that is earned and maintained -- a zone of pricing freedom, a "FairPay Zone." The details of how FairPay does this are in the sidebar, the related Web site, and the many posts here. 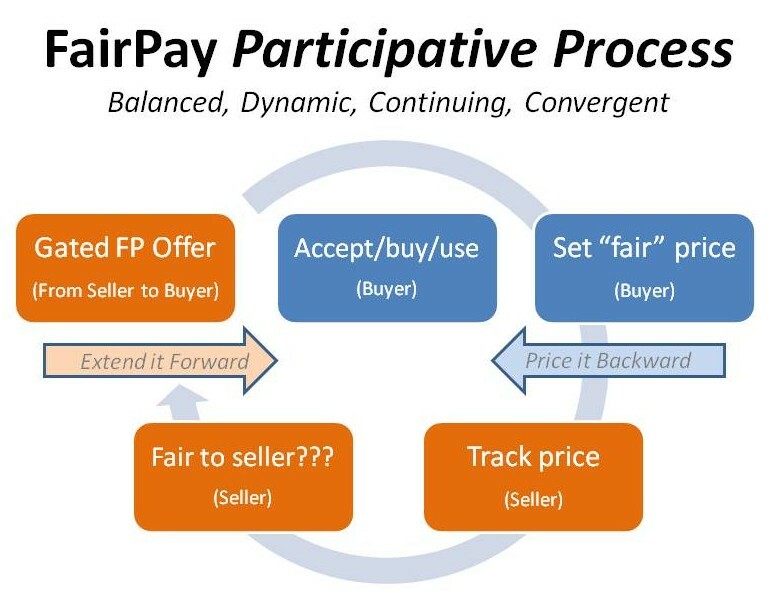 FairPay is not the answer for all offerings in all markets, but I think it can pervade many segments--and that its more collaborative model for marketplace relationships will fundamentally change a large segment of our economy. I suggest, that just as mass marketing changed the fundamental nature of commerce a century ago-- and disconnected sellers from buyers--relationship dialogs of the kind used in FairPay can remedy that and create a new and higher level of engagement. That dialog and engagement create and guide a new force for funding "The Culture Business" that Levine is rightly concerned about -- a new paradigm for the invisible hand. I commented at NYTimes.com on Tom Friedman's 12/18 column that suggested the emergence of a new level of democracy in many domains, in which consumers are gaining more equal power with organizations of all kinds. We are only at the beginning stages of this (as Friedman quotes Dov Seidman): "when people are creating a lot of ‘freedom from’ things — freedom from oppression or whatever system is in their way — but have not yet scaled the values and built the institutional frameworks that enable ‘freedom to’ — freedom to build a career, a business or a meaningful life.” Friedman observes that we need leadership to find the "to." 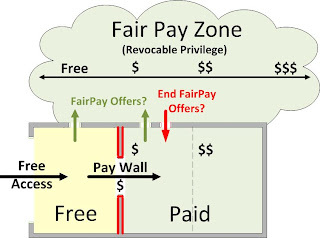 FairPay is an attempt to suggest one "freedom to" that can change the world of commerce for the better -- the freedom to set prices, constrained only by a responsibility to be fair about it. FairPay also provides an institutional framework -- an architecture for dialogs with customers that enable the freedom to do just that. The FariPay framework works by linking that consumer freedom to set prices to complementary methods that give sellers the freedom to manage the pricing risk related to that new buyer freedom. This is very apparent in the world of digital commerce, and I have suggestions on how "freedom from" will lead to "freedom to." The crisis in pricing digital offerings and the revolt that "content wants to be free" is just a start. We moved a century ago from negotiated prices to seller-imposed prices and widespread price “discrimination” by sellers that enabled efficient mass marketing, but distanced the seller from the consumer. Now digital products and networks have changed the game, and we have movements to free, "freemium," and even "pay what you want" and "name your own price." Digital businesses have found it challenging to adjust to this, and no current models really do the job. After a nice overview by our moderator Dr. Howard Morgan (Co-Founder and Partner, First Round Capital) we got into the perspectives of a diverse array of panelists. Paul Smurl (Vice President, NYTimes.com) shared insights into the closely watched Digital Subscription paywall strategy at the Times, which has gone even better than they expected to meet the challenge of generating reader revenue without loss of ad traffic--and given a boost to print as well. Betsy Morgan (President, TheBlaze.com, formerly of HuffPost and CBS Digital) noted how they were monetizing Glen Beck's TV offerings with direct OTT (Over The Top) subscription services, that are already generating $10 per month from 230,000 subscribers. That may seem small compared to the Fox audience, but when you consider the share to Beck, that gets very interesting. Shawn Price (President, Zuora.com) provided insights on what Zuora calls "The Subscription Economy," based on work with over 500 companies. He noted the power of a flexible platform like Zuora's to adapt in real time with some 100 different control parameters, and how it makes it manageable for content and service providers to apply very advanced and nimble e-commerce strategies. --the opportunity to apply a new level of detailed market research that is fully integrated with every transaction. All of the speakers noted how important it was was know your customers and track them in real time, and how some aggregators/distributors (notably Apple) impede that critical task in a way that can ultimately be very limiting to sellers of digital offerings. 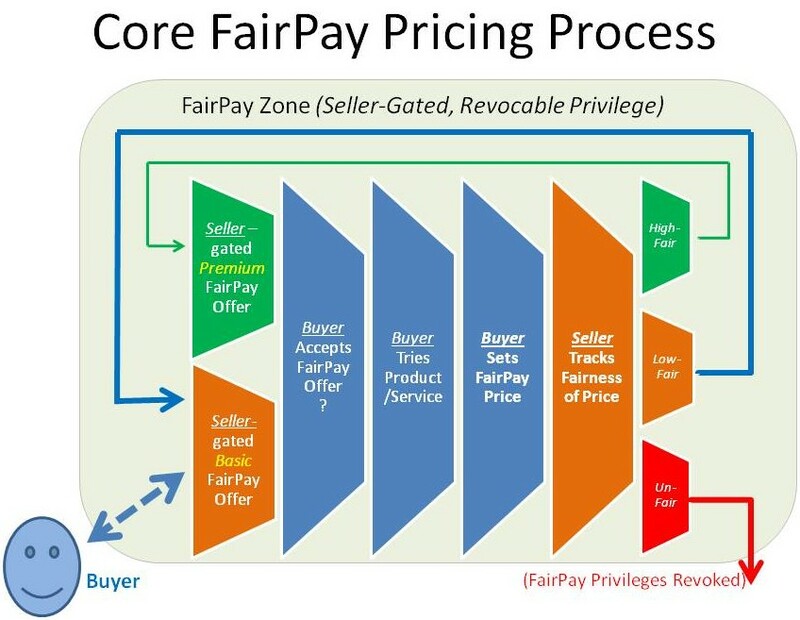 I was very pleased with the response to my presentation of FairPay, and to my latest attempts to make it easier to understand. The challenge is that while FairPay is quite simple in its basic concept, it changes many of our core assumptions about doing business at many levels, and has very deep ramifications in ways that take some thought to fully understand and appreciate. The discussions and questions on how and where FairPay works indicated that many people found food for thought. The posted slides may show some of this, and I expect the video should be available soon (to be linked below). I also plan to adapt this presentation to add better explanations to the Web site and this blog. My thanks to the other speakers, and to the audience for a very stimulating session. ...And for anyone who wants a really detailed preview of what I suggest are groundbreaking ideas on where the future of digital media business will go (or just needs help getting to sleep), the USPTO published my FairPay patent application yesterday.